Useful information and advice for pet owners ... and their pets! Walking your dog out without their leash is often quite challenging, mainly because of a variety of distractions such as vehicles on the road, squirrels, and more. It requires meticulous training and building a strong relationship based on trust and respect with your dog to make them learn to walk without the help of the leash. How to Train Your Dog to Walk Off Leash? You must understand that dogs have a curious nature which makes it difficult for them to focus and follow your commands. Be patient and think of ways to get their attention and teach them to heed your instructions properly when off leash. They don’t understand the command – You may have to go back and start over from the beginning to help your pup. They don’t care – It could be due to a lack of motivation in which case your dog might find other activities such as chasing a squirrel or playing with a toy to be more interesting. They are afraid of you – This could be an indication that you are too harsh on your dog. You must try to be gentler and loving towards them. Practice is the key here. Have daily training sessions to teach your dog the desired behaviour when walking without their leash. You can also make it fun by including the lessons in their regular playtime. The safest way to teach your dog is to practice at a dog park or other fenced place. It is one of the most effective ways to train your dog to walk without their lead. Use your dog’s favourite treats to motivate them. Also, praise them in order to let them know that you are happy with their behaviour. Sit, stand, stop, down, no, yes, come, drop it, and over here are a few of the basic commands that your dog must know and learn to obey. It will help you with training your dog to walk without your lead. Rewarding your dog often will help you gain and keep their attention focused. However, if you keep giving them treats frequently, they may lose interest which is why it is important to strike a balance here. 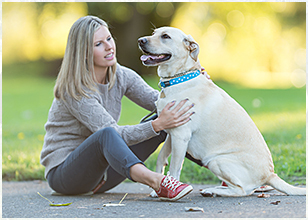 If you have had a difficult time training your dog and seem to have gotten nowhere with making them learn good off leash behaviour, you could consider working with an experienced dog trainer such as Alpha Paws. Alpha Paws is a well-known name as far as dog training is concerned. Our experts are skilled at training a puppy to walk off leash and can help your pup obey commands when roaming freely and develop good walking skills without your lead. 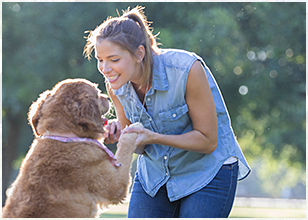 For more details about our dog training program, feel free to call us at 1-877-868-5248 (PAWS) to talk to our experts.